Let’s talk umbilical cords, Mama! Despite being such a normal and important part of the birth process, umbilical cords are often not mentioned much during pregnancy, and many mamas aren’t entirely aware of what their purpose is, or what happens to them at the time of baby’s arrival! Put simply, umbilical cords are the lifeline between you and baby in the womb. It connects your growing little one to your placenta, and contains two arteries, and one vein. 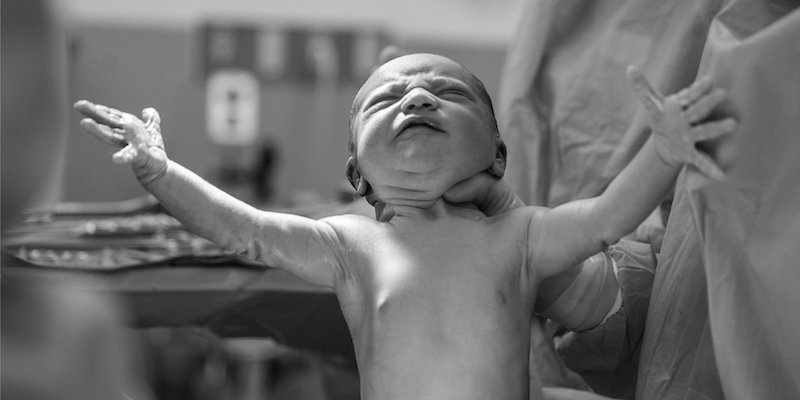 The vein supplies Baby with oxygenated and nutrient-rich blood from your placenta. And in return, their heart pumps deoxygenated, nutrient-depleted blood back through the arteries to your placenta! In theory, the umbilical cord becomes useless during childbirth, and is cut at the time baby is born–it is clamped by a medical professional, and it is up to you who cuts the cord. It can be your partner, your doctor, or yourself! Once cut, there will still be a small stump of it left connected to your little one — no need to be concerned, it will fall off on it’s own in 1-2 weeks. All that being said, research by the ACOG (American College of Obstetricians and Gynecologists) has found that delayed clamping, or waiting to clamp the cord until 30-60 seconds after your little one has joined you earthside, has significant benefits as opposed to clamping it immediately! The benefits vary depending on if your baby is preterm or has been carried full term, and the choice is entirely yours, but here’s why you should consider delayed clamping! If your baby is delivered before your full term of 39 or 40 weeks, the benefits of delayed clamping are even greater! Delayed clamping can result in significant neonatal benefits, which you’ll find is imperative for preterm little ones. Improved transitional circulation. Transitional circulation is the shift from fetal blood circulation to newborn blood circulation. This is started as soon as the umbilical cord is clamped — the delay improves your newborn’s chances of a successful and efficient transition. Better production of red blood cell volume. It’s common for newborns to have some level of anemia in their first few months of life — as their body grows quickly, it’s hard for their red blood cells to keep up in production. Having a leg up in that area can prevent their chances of anemia and set them up for better health! Lowers chances of blood transfusion. Similar to the above, preterm babies can often be in need of blood transfusions due to a lack of red blood cell volume and in cases of anemia. Delayed clamping can help to decrease the odds that a transfusion is needed. Lowers chances of hemorrhages and other diseases. For the same above reasons, those additional red blood cells give baby a much better chance of being their healthiest selves! There may be less total number of benefits for full term babies, but it doesn’t make delayed clamping any less beneficial! Increases their hemoglobin levels at birth. Better hemoglobin levels help to prevent tragic outcomes like brain hemorrhage, necrotizing enterocolitis, and oxygen dependency. Establishes better iron stores for several months after birth. This can help prevent anemia in your little one for months after they’re born! Can help to prevent chances of iron deficiency for their entire first year. This is a huge benefit, as iron deficiencies have been linked to developmental issues in baby’s cognitive, motor, and behavioral abilities. It’s amazing to think that a mere 30-60 seconds can make such a drastic change, but for a newborn, that timeframe is worth its weight in gold! Making that choice for that minute can set your newborn up for their best health and chances! As always, we encourage you to speak to your healthcare provider when making any medical decisions.